I blinked in surprise as tears moistened my eyes. A masterpiece sculpture at the Berghese Gallery in Rome towered before me. Gian Lorenzo Bernini’s work simply captivated me. Why did a piece of marble stir my soul so deeply? Oddly enough, a book about envy helped me understand. 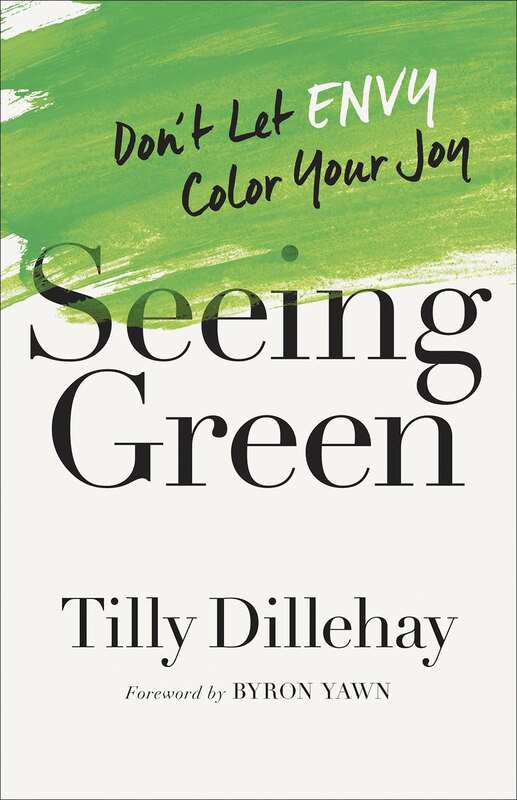 According to Tilly Dillehay in her debut book, Seeing Green: Don’t Let Envy Color Your Joy, you can’t address envy until you grasp how you interact with the hints of God’s glory in your daily life. People bump into bits of God’s glory everywhere: in nostalgia, love, praise from a superior, the yearning for another land, the desire to be on the “inside,” and, yes, the beauty of art. Dillehay—a homemaker, pastor’s wife, and TGC contributor—argues that God’s glory is wrapped up in “all things meaningful, all things worthwhile, all things beautiful, and all things that quicken the pulse with joy and quicken the mind with sight” (20). God created us to respond to his glory, even the borrowed glory of those around us. Meanwhile, the rather uncomfortable reality is that we have all received varying measures of borrowed glory. Harvest House Publishers (2018). 208 pp. $14.99. You know that feeling, don’t you? That heart sting when someone else receives the very thing you desire. When your best friend announces her engagement. When your sister says she’s pregnant. When your coworker gets the promotion. You tell yourself you’re happy for her, but you feel a hint of something else. That something is envy. What if, in those moments, you were able to turn away from the green glow of envy, and see the spotlight of God’s glory shine on your friend? What if your first response was joy? Join Tilly Dillehay as she uncovers seven common sources of envy and challenges you to change the way you think about God’s glory. Dillehay debunks the politically correct myth that we’re all equally beautiful, or “all equally fill-in-the-blank.” We’re not all equally beautiful—some people are better-looking than you are. Some are smarter than you are. Some are funnier than you are. As we encounter such people, we will respond in some form of either worship or hatred. It’s impossible to get through Dillehay’s book unscathed. If you believe envy isn’t a problem for you, read this book and think again. Seeing Green systematically shows the many ways envy can rear its head: through body envy, charm, influence, intellect, money, options, creativity, competence, control, and relationships. Though churches often tolerate envy as a quiet lesser-sin, seeing green is poison from beginning to end. Unlike other sins such as lust or pride, Dillehay explains, envy never lights up the brain with pleasure. Though churches often tolerate envy as a quiet lesser-sin, seeing green is poison from beginning to end. With her definition of envy, Dillehay explains that the person who has what I envy is “felt by me to have the advantage of me, and I resent it” (32). Among all demographics, Dillehay believes that artists are the most prone to envy. She may be right. I recognized seeds of envy in myself even while reading her book. Commonalities in our upbringings stirred a sense of comparison in my heart. Unlike the Bernini statue that awakened wonder and worship, this book ignited competition. I subconsciously weighed her writing against my own. I became aware of areas of inequality in our writing—areas where she is superior to me. God helped me recognize and dismiss those seeds of resentment, and instead benefit from Dillehay’s many insights. Art, she explains, makes us feel “close to touching the meaning of the universe” because it taps into our human need for stories (104). Art connects us to God’s big story, which is a tale of romance and war. The artist, she claims, is a warrior in the middle of God’s story. All artists, whether they know it or not, create works that reflect either truth or lies. Their artistic medium—be it words, music, or a paintbrush—is a tool in the battle. The big takeaway is that any message of truth communicated through art should cause us to rejoice—as a warrior rejoices with news of victory at another point in the battle. “If we can’t rejoice at genuine strokes of beauty wielded against our satanic enemies,” Dillehay writes, “then we are obviously blind to the battle” (107). But how do we kill envy, once our eyes are opened to its presence in our hearts? Dillehay doesn’t leave the reader gasping for help. She includes biblical tips for killing envy and entering a life of freedom. The fight against envy is won through conscious decisions to put on love, diligence, humility, and appropriate transparency. As we choose behavior that pleases God and blesses others, our emotions are likely to shift into their appropriate place. I remember talking to a mentor about a troubled relationship. She spoke hard yet transformational words: “It’s not your job to pray that God will fix them. Pray that God will bless them.” Dillehay offers similar advice: Thank God for the success of the person you envy. Ask him to further their success. Over the years, I’ve found that praying blessings on someone I’m struggling with is one of the most powerful ways God changes my heart. True love offers no room for envy. True love leaves no room for envy. As Paul famously put it, “Love does not envy or boast” (1 Cor. 13:4). As we love, we’re better able to run the race God has entrusted to us. And as we forsake envy and give ourselves to our calling, we’re able to multiply our God-given talents, be they many or few. Seeing Green takes a step forward in the battle against Satan’s deceptions. Envy is never okay. Envy destroys lives. But by God’s grace, we can fight envy and get on with the work God calls us to do.